Before Little Mouse was born, we did a lot of planning and preparation to reduce the cost of our growing family. We built up a stash of cloth diapers, attended the area's largest kids' consignment sale, and hit up lots and lots of garage sales. 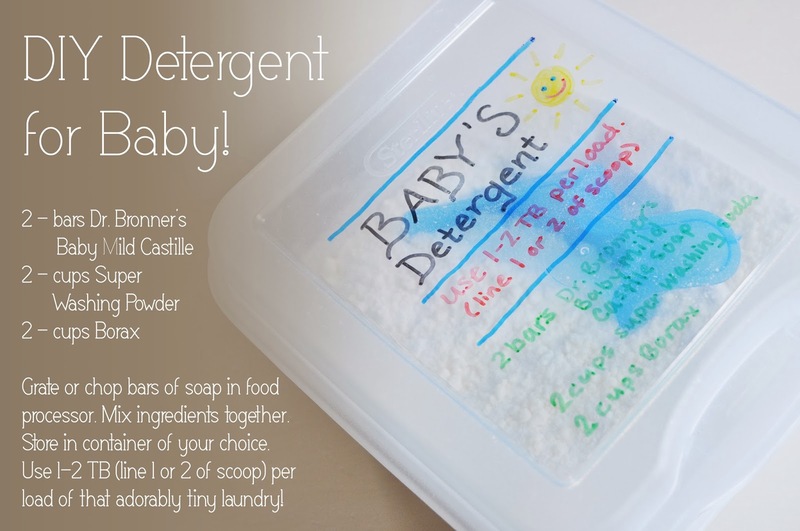 One of the ongoing things we chose to do to reduce cost was use our own homemade baby laundry detergent. Do you know how much laundry you end up doing in the newborn, crazy-breastfed-blowout stage? Ummm, a lot. Not only did using homemade baby laundry detergent ease the burden on our wallet, it also gave me peace of mind knowing that nothing harsh, chemically, or possibly irritating (see: fragrances) would be touching my new baby's skin. Yes, even detergents formulated for babies like Dreft have fragrances! So, you can either go the expensive, organic and all-natural store-bought detergent route, or you can make your own. The first batch lasted us about three months, but as mid-day outfit changes became a thing of the past, we got a little more mileage out of the recipe - about five months. Since it has served us SO well, I wanted to share our recipe as I set out making our third batch! - A food processor, knife, and cutting board for the quick & easy way, or a simple cheese grater for the traditional method. - A container to store your detergent. A smallish Sterilite flip-top container works well, or an empty OxiClean or other detergent tub. If you're going the traditional route, grate your soap against the cheese grater and pray you don't shred some of your finger along with it (You know as well as I do that it always happens. A-l-w-a-y-s. Usually toward the end when you start to think, "Hey, I made it without trauma!" and get a little cocky. SLICE!). If you're trying your hand at the new-and-improved method - which I highly recommend! 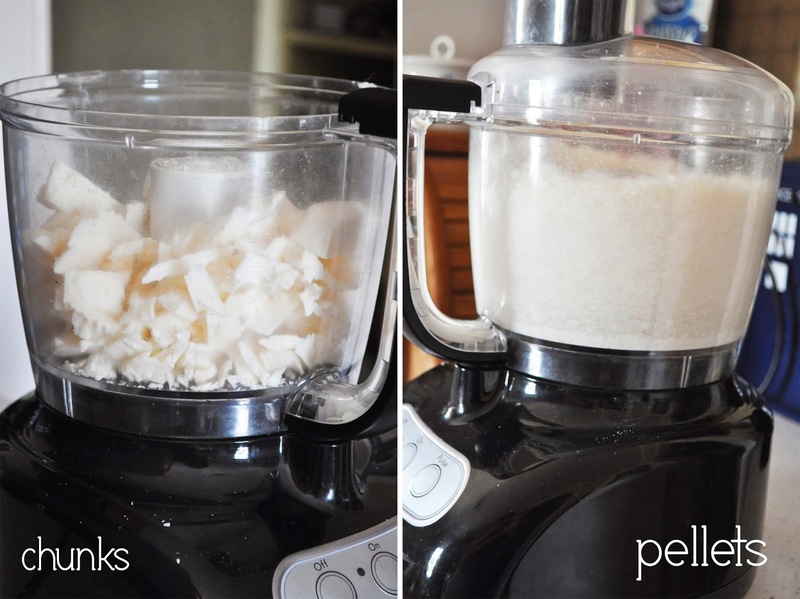 - prep your soap for your food processor by cutting it into chunks. 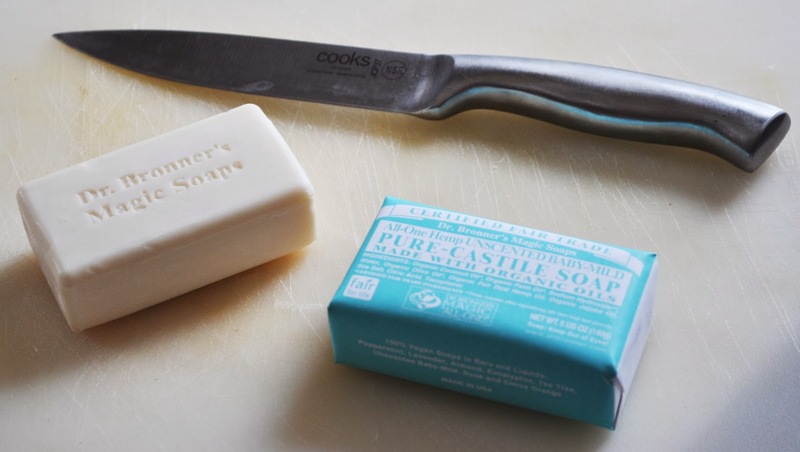 You'll notice that the soap sort of flakes as you cut it, making this process even easier. Drop the chunks into the food processor and process the soap until you're left with sweet little soap pellets. Mix your washing soda and borax together first, then add in your soap pellets. Mix well, toss in a scoop for measuring, and you're done! Use 1-2 tablespoons per load of laundry (that's line 1 or 2 if you're using a scoop) for fresh, clean, odorless and chemical/additive-free laundry - perfect for delicate baby skin! This recipe works well for the whole family's laundry, and can even be scented with a drop or two of your favorite essential oils, if desired - geranium or lemon are my favorites for my & hubby's detergent! Have you ever made your own detergents or household cleaners? Did you like it? Did you choose to DIY on cleaners to save money, live naturally, or another reason? This is very excellent and informative post. Really home made laundry detergent is very suitable for clothes. get more info visit this blog get more info.